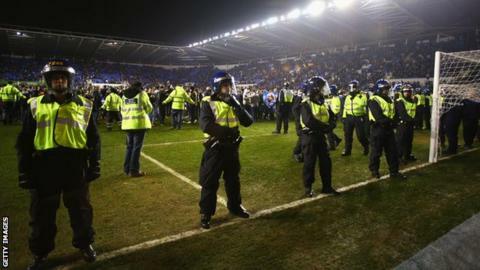 Reading have had an appeal upheld to reduce a fine for failing to prevent a pitch invasion during an FA Cup tie. The Championship club were initially fined £100,000 for disturbances at the quarter-final replay against Bradford at the Madejski Stadium in March. An appeal board has issued the club with a reduced fine of £40,000. A club statement said: "We are pleased that our appeal has been heard and upheld in our favour in terms of a reduced sanction." Reading won the quarter-final replay 3-0 but were beaten in the FA Cup semi-final by Arsenal after extra time.